Activists worldwide have been organizing, educating, protesting, writing, and sharing stories and videos to tell the citizens of the world just how bad the proposed Trans-Pacific Partnership (TPP) deal is for people. After all, anything written in secret by 600 multinational corporations can’t be good for us. 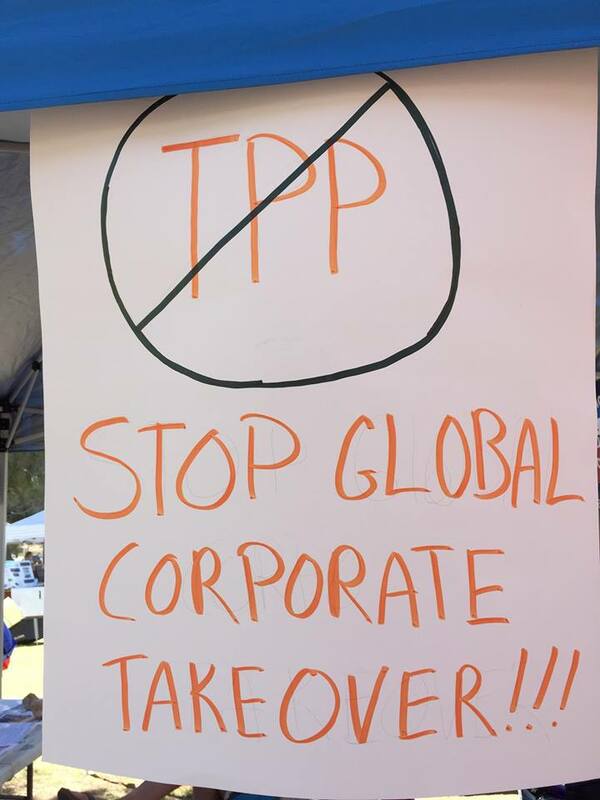 This Wednesday– June 3, 2015– is another national day of action against the TPP. Organizers are calling on us– all of us– to call our representatives in the US House of Representatives on Wednesday and tell them to vote NO on the fast track authorization for the TPP. Kyrsten Sinama: She has been a Wall Street darling since she went to Congress, but a recent anti-TPP protest at her office may have sparked a no vote on the TPP. Let’s encourage her to stand with us this time– instead of Wall Street. Most Democrats are against the TPP because it is bad for workers (to put it mildly), while most Republicans– ironically– are aligned with President Obama, who has been a TPP cheerleader and who is responsible for the secretive nature of the TPP. No one can read it. What’s up with that? The TPP has 29 chapters, and to date, only a handful of chapters– intellectual property, environment, investment — have been released to the public by WikiLeaks– not by President Obama. Check out this recent Democracy Now interview with Julian Assange of WikiLeaks here. And this one about copyright laws under the TPP here. The PDA Tucson website here also has several other TPP videos. #StopFastTrack and #FlushTheTPP. Let’s stop this deal because it is bad for people and bad for our planet. More that you might like to consider. For all the “hair on fire”…. And Jim, sorry, but you have it exactly backwards. Would that be Barney “I need a sell my book now” Frank? Barney Frank explains why progressives are against TPP in a Boston Globe op-ed piece. Basically, corporations are loving it, but workers get nothing in return. Obama just doesn’t understand (or care) about the lopsided nature of the deal.